In the middle of the city the suburb of Darlinghurst has very small units with no side entrance or garage typically. The only access for this unit was through the front door. Bamboo had been planted in an elevated benched area between two brick walls in the courtyard area. The bamboo had grown out of hand and was hard to keep on top of the recurring growth. 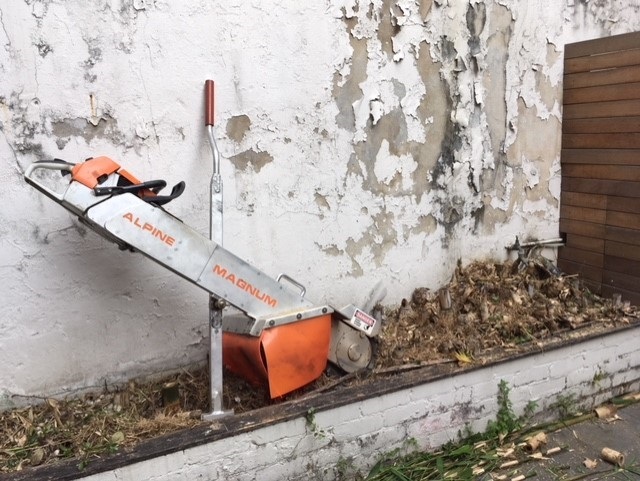 Because of the tight access and the elevated position of the bamboo it could only be removed thoroughly with the hand held stump grinder. The bamboo had white pebbles throughout the root system from when it was initially planted which made it more difficult to grind as panes of glass surrounded the courtyard and also had a water tap above some of the bamboo that I had to err on caution not to cause damage. The bamboo was first cut down to ground level and the bamboo was ground into a fine woodchip and was used as a top layer of garden mulch.